Defensive end William Fuller would leap to the NFL after playing two note worthy seasons for the Baltimore Stars of the USFL. After leaving the USFL he would report to the Rams, but they subsequently traded his rights to the Houston Oilers as part of the trade that sent Jim Everett to Los Angeles. At first it appeared that the Rams got the better end of the deal, as while Jim Everett passed for good numbers and established himself as a top end quarterback Fuller’s sack numbers were slow to increase. 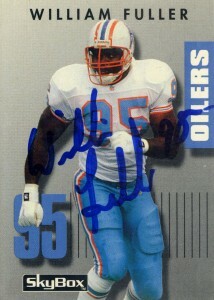 Despite his slow production by 1988, Fuller tied for a team high with 8.5 sacks under coach Jerry Glanville. His 1989 and 1990 seasons would also show marked improvement. 1991 would be his best season as a pro as Fuller would finish 2nd in the NFL in sacks with 15, and be named to the ProBowl for the first time. 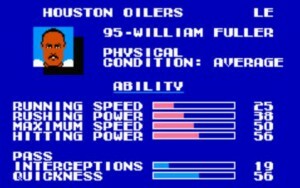 After a down year in 1992, Fuller would return to double digit form again in 1993 making 10 sacks but Bud Adams made good on breaking up the Oilers, and let the venerable defensive lineman go via free agency to the Philadelphia Eagles in 1994. William would pick up where he left off, making 35.5 and 7 fumble recoveries over the next 3 seasons for the Eagles. Each season he’d also be named to the Pro Bowl, but after 1996 he’d leave via free agency again for the San Diego Chargers, and retire after the 1998 season. At the time of his retirement his 100.5 sacks ranked him top 25 all time. Since retirement Fuller has been named to UNC’s sports HoF, the 50th Anniversiary team, and has is active in programs to help prevent diabetes. He has donated time to coach at the local high school in Virginia Beach and is a real estate developer. SkyBox too attempted to create a premium line of football cards in 1992. While Stadium Club was impressive, and Fleer was lowering the bar, Skybox’s Impact was just- well confusing. You just didn’t get which brand was actually the premium brand of SkyBox’s football line with a Primetime and Impact line that were both pretty nice looking. The real problem was Skybox didn’t trade for a year or two before they came out with a the premium line, so the market just got muddled down. While their team MVP cards and special mini poster insert cards were amazing, Skybox’s general design for their Primetime cards left much to be desired- much as in the William Fuller card above. It’s strictly okay by design standards with a generic shadow on a gray-silver plane, but what is up with the | | | | in the background? Skybox also had this penchant for gigantically displaying their logo on their cards, which was equally distracting, especially with the background isolated in a single color. The team name “Oilers” goes up the side on the right which is a complete design gaffe. Take one moment to look at your DVD collection. Do you notice on the spine of every DVD the type goes down the right? It’s just easier to read that way and it has always been sort of an unspoken standard for many years. I like how they added the number, but it’s turned into a disastrous tangent with his fist slightly obscuring the 9 on the 95. William’s name is tracked out, which is maybe a bit much, but the other tangent as his name almost taps the top of his helmet is equally annoying. I wasn’t a big fan of this line of Skybox cards in the end, but the “Impact” series that they debuted earlier that year was cutting edge at the time.